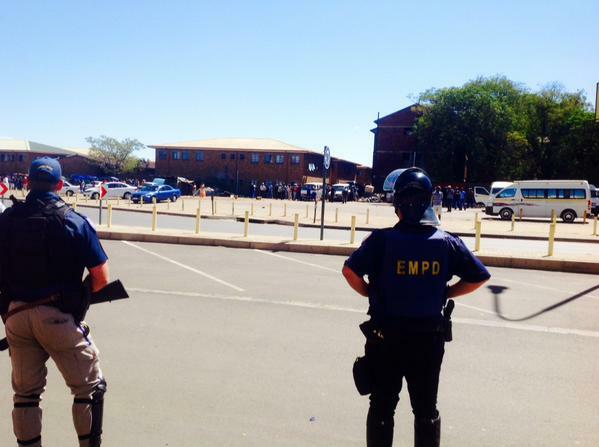 Police in and around Gauteng’s East Rand are on high alert after xenophobic attacks spread to the area on Thursday. “So far we have had scares and rumours in the Daveyton and Etwatwa areas. In Primrose there were reported confrontations with foreigners holing up at the police station and service stations,” Kgasago said. According to Boksburg police spokesperson Lieutenant Kwendzakwakhe Ngobese, about 1 000 panic-stricken foreigners left their shacks on Wednesday night and gathered at the side of Main Reef Road. They were scared South Africans would attack them while they were asleep in their shacks. Others reportedly went back to their homes in the early hours of Thursday, but they slept on the roofs of their shacks, as they were scared locals would set fire to the structures. Police were also monitoring the Ramaphosa Reiger Park areas, although no incidents of violence had been reported. However, in Benoni, police have fired rubber bullets in attempts to disperse a crowd throwing bottles and stones at police in the Benoni CBD on Thursday. Meanwhile, the South African Police Service has announced the activation of joint operational centres across the country to help deal with the latest flare-up of xenophobic violence. The police’s Solomon Makgale says the centres will be run on a 24-hour basis. “We have also activated similar centres across the different provinces. We have also deployed additional crime intelligence operators on the ground so they can provide us with information as to what is going on at a community level,” he said.